Each component of a window and door --- from the insulated glass to the hardware --- is encapsulated within the frame. A well-crafted frame begins with high grade raw materials that are transformed to windows and patio doors through a strict quality-control process. Milgard selects frame materials with purpose and stands behind every finished product to provide long-lasting performance. Wood is prized for its natural beauty and warmth. 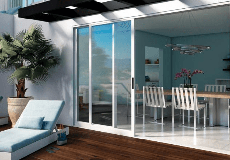 Learn the advantages of selecting wood window and patio door frames. Well-designed fiberglass windows and patio doors enhance curb appeal and are very durable for long-lasting performance. Vinyl frames are energy efficient, UV resistant and require little maintenance. See the benefits of this affordable option. The strength and contemporary look of aluminum makes it timeless frame material that architects and builders have specified for years. You have a lot of options when it comes to glass. Learn more about sun protection, noise reduction and privacy glass available. Use this handy chart to see all frame materials, operating styles, colors and hardware available with Milgard windows and patio doors.